The second day of the Northeast Astronomy Forum (NEAF) got underway early with a meeting of the board of the Astronomy Outreach Foundation (AOF), a group of telescope manufacturers that is assembling programs to promote the hobby. Working with partners including Astronomy magazine, the Astronomical Society of the Pacific, the International Dark Sky Association, and other groups, the AOF is going to have a big year with new surprises, some of which you will see in the next few weeks. 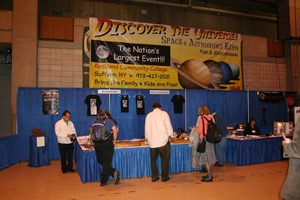 The program itself at NEAF was busy and varied on Sunday, with solar observing outside and talks inside. 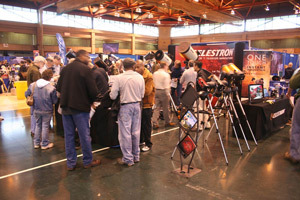 The presentations included a workshop put on by astroimager Thierry Legault on his photography of solar and lunar transits of the International Space Station. Astronomy Contributing Editor Bob Berman spoke on how the human eye perceives color and light in the universe. Heidi Hammel of the Space Science Institute gave the audience an update on the James Webb Space Telescope. Steve Howell of NASA's Ames Research Center spoke on the latest developments with the Kepler Space Telescope. And the Meteorite Men from the Science Channel, Geoff Notkin and Steve Arnold, spoke about rocks from space and how to collect them. Alan Traino flitted about as always on a very high-energy level and coordinated many of the details of what was going on. Alan’s direction of the show makes the whole thing a guaranteed success. You’ll see many of the interesting products and people who were displaying their wares at NEAF this year in the accompanying set of photos. What a great year it was for NEAF! And now I am off to New York City to work on two stories that will appear later in the magazine.